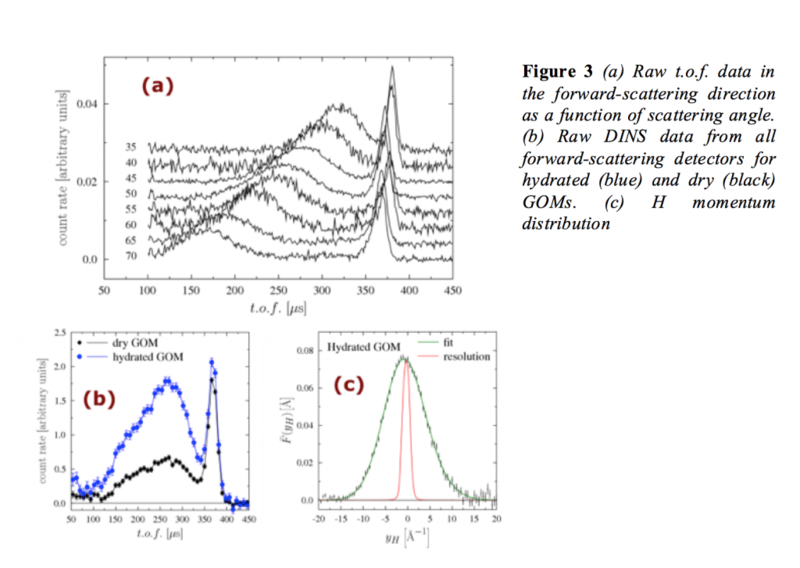 Researchers from NAST Centre have studied the single particle hydrogen dynamics in 2D Graphene-Oxide at the ISIS Spallation Neutron source. This 2D material has gained an increased interest in the last few years, given the presence of polar functional groups on Graphene-Oxide layers makes the material hydrophilic, thus favoring large quantities of water to be adsorbed between layers. Water confined in GO has been characterized using the Vesuvio spectrometer at ISIS Neutron and Muon Pulsed Source in UK. The hydrogen local chemical environment under spatial confinement is discussed in the context of the interaction between the interfacial water and ice and the confining hydrophilic surface of the GO sponge. Mass-resolved neutron spectroscopy allowed a simultaneous and non-destructive measurement of water-uptake levels in hydrated and dried samples and highlight the effect of confinement on the hydrogen local potential. 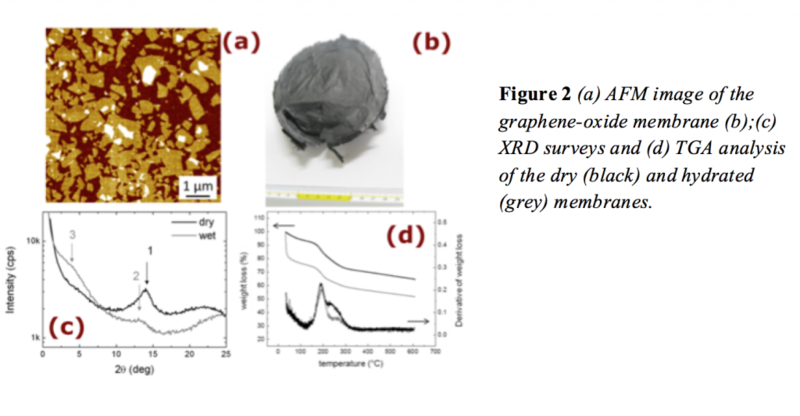 Hydration of the Graphene-Oxide Membranes was also extensively characterised by X-ray diffraction, atomic-force microscopy, thermal gravimetric analysis and elemental analysis by dynamic flash combustion. Results reveale that hydrogen dynamics is little affected by the extreme confinements within graphene-oxide layers, i.e. the number of structural hydrogens from hydroxyl groups is negligible as compared to the one belonging to water, trapped during the production process. Figure 1 Pictorial reconstruction of water confined between bi-dimensional layers of Graphene-Oxide.